"Joni G. McNutt and Cynthia J. Roy, Westbrook College, Class of 1978"
Westbrook College student Joni G. McNutt, Class of 1978, was a Medical Technology major and lived in Proctor Hall. 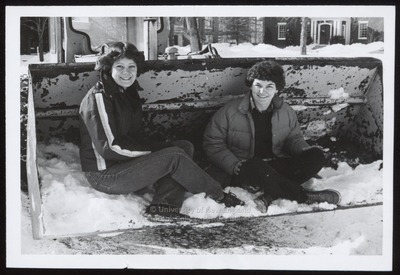 For her senior class candid photo, which appeared in the 1978 Tower Yearbook, she wore jeans and and a zippered ski jacket with bands of lighter color on the arms. Cynthia J. Roy, Class of 1978, was a Fashion Merchandising major and lived in Proctor Hall, also. She wore dark jeans, a dark crew neck sweater and a dark quilted, puffy winter jacket. Both Joni and Cindy had short hair--Joni's was straight and parted in the middle, Cindy's was curly all over. They sit together, legs crossed, in the shovel of a small snow plow.